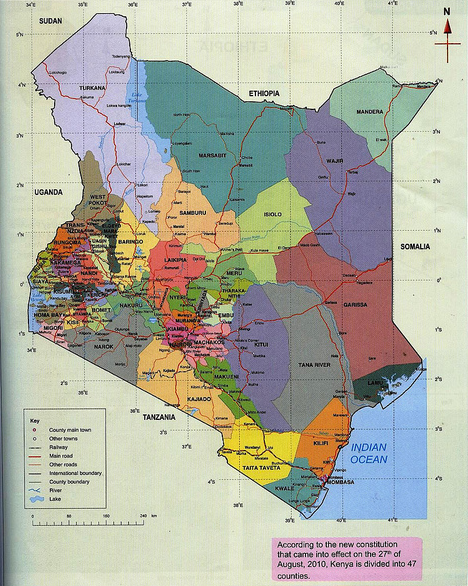 Kenya is located on the East Coast of Africa bordering the Indian Ocean to the east, Sudan and Ethiopia to the north, Somalia to the north east; Uganda to the west, and Tanzania to the south. It covers an area of 582,646 sq km ranks number 47 in the world in terms of size. Kenya enjoys a tropical climate with temperatures averaging about 22°C throughout the year. It is hot and humid at the coast, temperate in the central and western region and dry in the north and north eastern parts of the country. It’s hottest period is from January to March and the coldest month is July with temperatures going as low as 10°C in the higher altitudes. It has two main rainy seasons: short rains (October-December) and long rains (March-June). Kenya has diverse physical features, which are divided into: Low Lying Arid and Semi-arid Lands, Coastal Belt, Plateau, Highlands and the Lake Basin around Lake Victoria. The Great Rift Valley which extends for 8,700 km on the surface of the earth from the Dead Sea in Jordan to Beira in Mozambique runs through Kenya. Mt. Kenya ,the second highest snow capped mountain in Africa with an height of 5,199m above sea level is located in the central region of Kenya. Kenya has an estimated population of 40 million people approximately 6 million of whom live in the major cities and towns. There are 42 ethnic groups with diverse languages and cultures. The major ethnic groups are the Kikuyu, the Kalenjin, the Luhya , the Kamba, the Maasai, the Meru, the Giriama, the Somali , the Borana and the Taita. There is also a good number of Indians, Arabs and European who live mainly in various urban areas. The national language is Kiswahili and the official language is English. Kiswahili is spoken by a majority of Kenyans and is also spoken in Uganda, Rwanda, Burundi, Tanzania and eastern parts of the Democratic Republic of Congo. Generally, anybody who has basic education in Kenya speaks some English as it is the language of instruction in schools.Nairobi, the capital city of Kenya is also the seat of government as well as the financial and service hub of East Africa. Kenya has many tourist attractions ranging from the sandy beaches at the coast, diverse flora and fauna, game parks, cultural heritage, scenic landscapes just to name but a few. Nairobi National Park is within the boundaries of the City of Nairobi. Also close by is the popular Giraffe Centre where visitors can watch and even feed the giraffes. Other attractions in Nairobi include the National Museum and the Karen Blixen Museum. The country’s notable tourist attraction is the annual wildebeest migration at the Maasai Mara. It is a sight to behold and has been dubbed the 7th wonder of the world. The education system is similar to that of Canada in that it has 8 years of primary school, 4 years of high school and 4 years of university. It is popularly known as 8-4-4 system of education. High school graduates of the 8-4-4 system can join middle level colleges and universities depending on their performance. Like many developing countries, the level of unemployment in Kenya is quite high. There is a high demand for jobs by the youth who make over 60% of the population. Several measures, however have been put in place to create employment for the many unemployed and underemployed youth. Kenya is known internationally in the world of athletics. It has some of the best athletes in middle and long distance races such as marathon, steeple chase, 1500 m and 800 m. It took the top position at 15th IAAF world championships held in Beijing, China from 22nd to 30th August 2015.It won a total of 16 medals 7 of which were gold medals. The Kenya Shilling (KES) is the official currency of Kenya. It is sub-divided into 100 cents. The highest denomination is 1,000 KES. Agricultural products are the backbone of Kenya’s export with tea and horticultural products being the most important. Other exports include coffee, tobacco, leather, textiles and cement. It imports machinery, motor vehicles and pharmaceutical products among others.